Parents who depend on larger strollers to get through the day at a Disney theme park may need to break out their tape measures to make sure their strollers fit Disney's new guidelines. The new policy, set to go into effect May 1, 2019 at both the Disneyland Resort in California and the Walt Disney World Resort in Florida, restricts stroller sizes to no larger than 31" wide by 54" long, a decrease of 5 inches in width from current guidelines. The new rules also ban the use of accessories that are attached to strollers or electronic conveyance vehicles (ECVs), such as stroller, glider boards, or trailers. 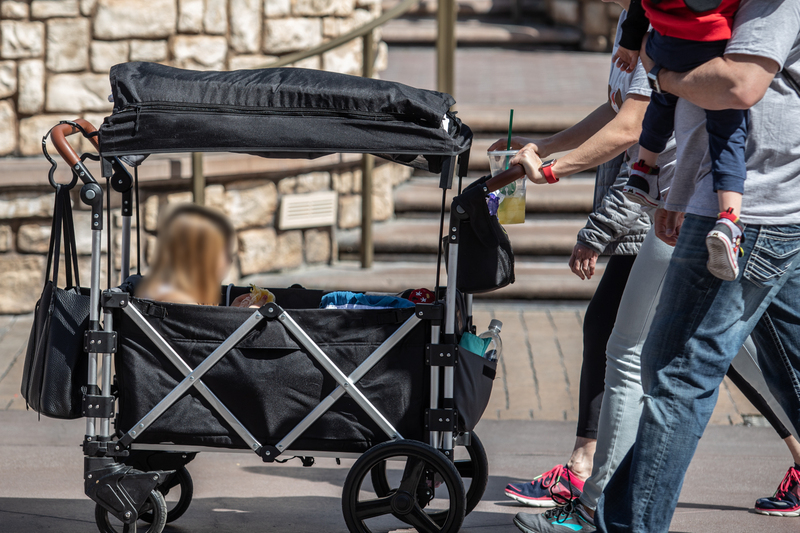 Despite an official ban, stroller wagons are a common sight in the Disney theme parks. Photo by Todd Pickering. The most controversial aspect of this policy update may be that Disney will begin enforcing an existing, written policy (which was routinely ignored): a ban on all wagons inside the theme parks, including traditional pull wagons like the Radio Flyer and Step2, as well as collapsible stroller wagons like the popular Keenz 7S and Veer Cruiser. Although Disney used to make an exception for models that could be pushed as well as pulled, that is ending as of May 1. At the Disneyland Resort, the new policies will be enforced at the guest screening and security tents. Visitors arriving at the Mickey and Friends parking structure or Downtown Disney screening tents with an oversized stroller, prohibited accessory item, or stroller wagon will be asked to return the item to their vehicle or hotel room, just as with guests who arrive carrying selfie sticks or other prohibited items. Disney is currently expanding the Toy Story parking lot and constructing a guest screening and security checkpoint there. Until that checkpoint opens, visitors who park in the Toy Story lot and those who come in through the Harbor Boulevard pedestrian entrance from nearby hotels may get as far as the eastern screening checkpoint before learning that their stroller or wagon is not permitted in the parks. Disney will offer to check oversized strollers and stroller wagons so that visitors are not forced to go back to their vehicles or hotel rooms to return their prohibited items. Disney officials say Walt Disney World will give more information about its enforcement plan before May 1. Florida's resort transportation bus stops have a sizing box painted on the ground so that ECV users can make sure their personal device meets Disney's standards before boarding. It should be a simple matter to update those markings with the dimensions for maximum permitted stroller sizes. In a move that will satisfy many Disneyland visitors, the California resort plans to introduce a new tandem double stroller by May 1, and make additional upgrades to its rental stroller fleet in the coming months. Disneyland has not previously offered a double stroller for rental, which meant that parents of multiple young children had to either rent multiple single strollers or bring their own double strollers from home. This is a sample of the tandem stroller that Disneyland visitors can rent at the parks starting May 1. Photo © Disney. Disney displayed a sample of the new tandem stroller, which appears to be the Joovy Caboose Too model. The company noted that the sample did not reflect the final color of the model that will be available in May, and that this is an interim solution until a permanent option is released in coming months. This a compact model, but offers child-friendly features, such as reclining seats and an adjustable sun canopy. 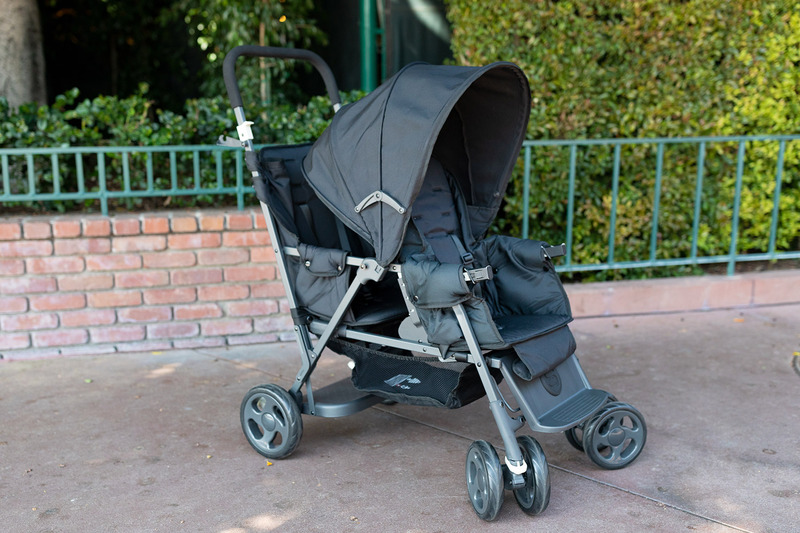 Disney displayed the stroller without its removable snack tray, and we expect that will also be removed from the rental models. Walt Disney World already offers double stroller rentals that fit within the new guidelines, as do the strollers offered by Disney's featured rental providers. There are several controversial topics within the Disney fan community, with the use (and misuse) of strollers right at the top of the list. When news of this policy change leaked earlier this week, the online reaction was swift and intense. "Parks are overcrowded and too many people are bringing huge strollers/wagons they can't maneuver safely in crowds and park them everywhere. Because for many families, a stroller isn't a place to stash the kid. It's having a place to stash their stuff. People “need” the big strollers to accommodate the diaper bag, backpacks, snack bags, and whatever else they're hauling into the park." Fans of stroller wagons argue that at 27 inches wide and 44 inches long, the newly prohibited Keenz 7S model is well within the new, smaller size limit. 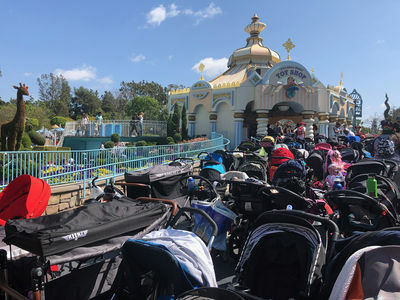 Jewel Pinkstaff, owner of City Stroller Rentals, theorizes that Disney's issue with the wagons is likely less about their size and more that people are using them to transport belongings rather than children. "People load them up like they're spending the day at the beach," she said of stroller wagons. She noted that the vast majority of strollers are under 31 inches wide, including the most popular models used by rental agencies like hers. The Keenz Facebook page often features photos of customers using the wagons at the Disney parks, and has hosted at least one meet-up at Disneyland. One Orlando-based stroller rental company posted a joint press release with the Keenz stroller wagon manufacturer, assuring customers that their product was in fact still allowed inside the theme parks. Disney officials tell us, however, that Keenz are not allowed in the parks after May 1—and it's unclear how or if Disney plans to address the misinformation being shared by the manufacturer. This updated enforcement should also help end confusion caused when Disney's stated policy conflicts with what is typically permitted in the theme parks. The Disney Parks Moms Panel frequently fields questions about stroller wagons, (like this one and this one in just 2019), and one panelist privately expressed frustration about having to cite the official policy in their responses despite knowing that the reality in the parks is often very different.